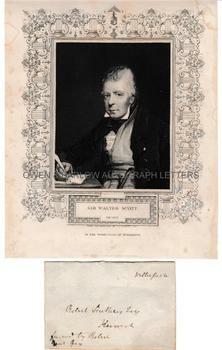 SIR WALTER SCOTT Autograph Letter Cover Addressed to Robert Southey. 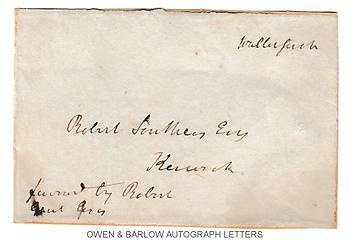 Letter cover signed by Sir Walter Scott and addressed in his hand to Robert Southey, Esq., Keswick. Together with a 19th century engraved portrait by H.T. Ryall after the original painting by J.P. Knight. 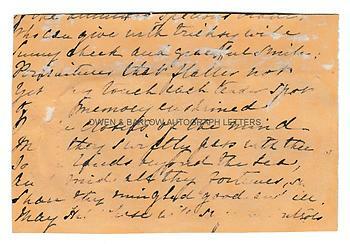 The address panel excised and laid down on piece of old manuscript measures 11 x 7.5 cms (4.5 x 3 inches). The engraving measures 23 x 18 cms (9 x 7.25 inches). Both in very good condition. A nice association. The two poets were friends and frequent correspondents. According to Scott's letters, he had been offered the post of poet laureate by the Prince Regent but had turned it down, suggesting instead that Robert Southey be appointed to the role, which indeed he was in 1813.